Retina UK aims not only to progress research along established threads, but to stimulate new thinking, encourage innovative approaches and nurture original ideas. 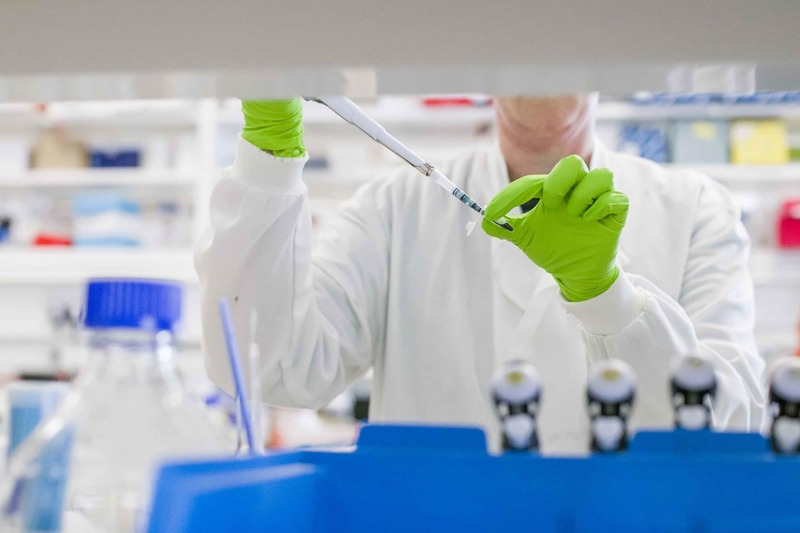 Our Innovation Fund supports projects of varying length which seek to explore new ideas or test new theories.We have made a commitment to support the talented research teams who are delivering the ground-breaking projects listed below. We are extremely grateful for each and every donation we receive. A PhD student supervised by Dr Rob W J Collin at Radboud University in The Netherlands will be studying the different genetic mutations which lead to Stargardt disease – a macular dystrophy which affects people from childhood and for which there is no cure. Stargardt is usually caused by mutations in the ABCA4 gene. Patients with two severe variants of ABCA4 develop sight loss early, as their code only contains the instructions to make harmful versions of the protein. Other people with a combination of severe and mild mutations produce a mixture of harmful and normal proteins and so tend to avoid symptoms until later. In some people with later-onset Stargardt, bits of the genetic code are mistakenly “skipped”. So like a recipe with steps missing, the resulting protein doesn’t turn out like it is supposed to. This project aims to understand how and why bits of the gene are “skipped”, and prevent the misreading of the gene that causes damaging protein versions to be produced. The studentship will enable a promising young scientist to lay the foundations for a future career in inherited sight loss research. LCA is the most severe form of early-onset retinal degeneration. This projects aims to increase knowledge of the molecular basis of this disease and accelerate development of an effective treatment. Dr Moosajee will develop new disease models, one using stem cells derived from a patient with LCA and one in zebrafish, so that both can be used to increase understanding of the effects of the disease-causing mutation in the RDH12 gene and test the potential of new drug and gene editing treatments. RP is commonly caused by a fault in a group of genes that regulate the editing of unwanted passages out of a set of genetic instructions, a process known as splicing. Already, the team’s work suggests that retinal cells are much more affected by mis-splicing than other types of cell. The team will continue investigating why this goes wrong in RP, and test new gene therapy treatments in a cell model. Non-viral gene therapy using S/MAR vectors for Usher syndrome. This project explores an alternative to traditional gene therapy, which may have implications for a wide range of inherited retinal dystrophies, not just Usher syndrome. S/MAR vectors have the capacity to hold much larger genes, and they have no viral components. The team will explore whether this new approach represents a safe and effective future treatment option. Modelling effects of TIMP-3 mutations in RPE – insights into Sorsby Fundus dystrophy and night blindness in retinal dystrophies. This project aims to explore how changes in a protein called TIMP-3 damage the retinal pigment epithelium (RPE), leading to Sorsby Fundus dystrophy. The team will also look at whether gene editing technology might be a viable treatment for the condition. Identification and functional characterisation of the missing ABCA4 variants in Stargardt disease. ABCA4 mutations affect the majority of people with recessive Stargardt disease and about 30% of those with con-rod dystrophy. This project aims to develop a cost-effective sequencing method for the entire ABCA4 gene, sequence 1,000 Stargardt’s cases worldwide and finalise a process for testing the effects of mutations. Ultimately the diagnosis of people with an ABCA4 mutation will be improved, and the identification of those suitable for participation in future clinical trials made easier. This project is building upon previous research to better understand why gene mutations that might be tolerated elsewhere in the body can cause disease in the retina due to errors in the way that the DNA instructions are edited in retinal cells. It is also testing potential treatments using stem cell technology.Update:Using an artificially produced retina the team discovered that photoreceptors maximise the information in their genes by splicing them together in complex ways to produce specialised proteins. This helps them to fulfil their highly complex function of detecting light, but it does make them more vulnerable to mutations. Sometimes they mistakenly splice in the wrong information, disrupting their function.A method called RNAseq has been used to identify the complex splicing events and which parts of the genes the photoreceptors stick together during the process. The team has also identified the time window during which the splicing process occurs, and has produced stem cells with intentionally disrupted splicing factors to test whether they affect photoreceptor function. A number of individuals with potential splicing faults have been identified to study in more detail in the future.The project is on track to reach its goals. It will continue until December 2019. This project aims to explore the mutation of the RP2 gene, which is one cause of retinitis pigmentosa. The mechanism by which this happens is not fully understood, but current data suggests that a reduced ability to deal with oxidative stress and DNA damage may be the issue. This project will explore whether this is the underlying cause, and will also test whether drugs which target DNA repair pathways and/or antioxidant therapies represent a suitable treatment option.